This gorgeous inflatable slide rents to events that want a slide that is fun and more relaxed than the adrenaline thrill of our steep 22 footers. 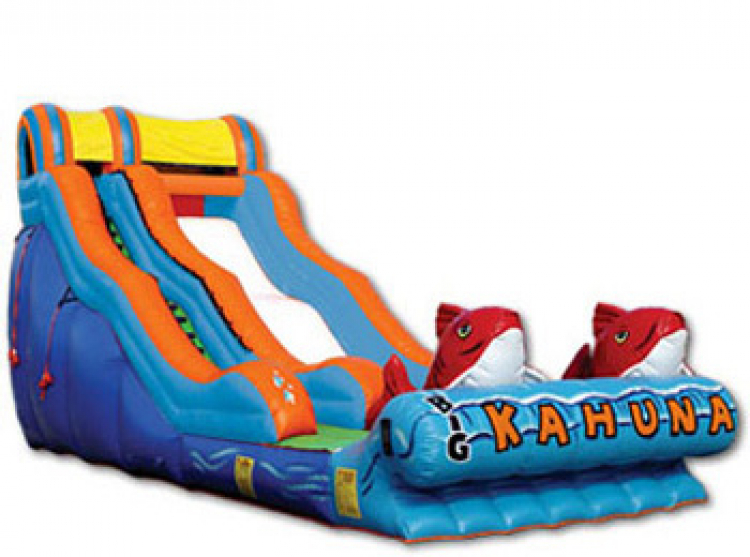 An excellent slide rental for any event, but especially for tropical luau parties. The bump in the middle gives the rider a little burst to their excitement level. Inflated fish beckon you to play. Safety screen helps riders sit down to slide. After sliding, can exit off slide or immediately climb stairs. Note: To rent the Big Kahuna as a water slide see the Water Play category. For non-staking ground surfaces, a sandbag fee will be added. Requires a 4 foot wide path to set up location.